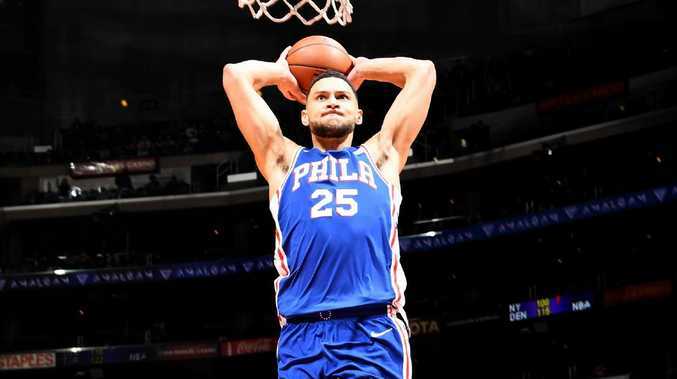 AUSTRALIA'S Ben Simmons notched a season-high 29 points as the Philadelphia 76ers' won a high-scoring NBA clash with the Phoenix Suns 132-127. Joel Embiid amassed 42 points and grabbed 18 rebounds and JJ Redick contributed 27 for the Sixers, who won on consecutive nights after dispatching the Los Angeles Clippers on Tuesday (local time). Embiid, who was questionable due to left-knee soreness, registered his league-best 33rd double-double and his league-leading 26th game with at least 20 points and 10 rebounds. He also became the first player to post at least 30 points and 14 rebounds in any half since Carlos Boozer on March 26, 2007, doing so before half-time. In addition, Embiid reached the 40-point mark for the fifth time in his career as the Suns, who own the Western Conference's worst record, lost their fourth consecutive game. Simmons scored 13 points in the first quarter as the Sixers surged to a 44-32 lead. Embiid was utterly dominant in the second quarter with 18 points. The Sixers pulled ahead 72-49 by the break as the Suns shot just three of 23 in the second period. The Sixers kept the pressure on and went ahead 92-63 on a sweeping right-handed hook shot by Simmons with 5:59 left in the third. Phoenix sliced the deficit to six late in the fourth, but Furkan Korkmaz hit a three-pointer and Embiid added a lay-up to help seal the tight win. In other NBA action, D'Angelo Russell registered 22 points and 13 assists as the Brooklyn Nets built up a big enough lead with a 73-point first half to withstand Anthony Davis' monstrous return to the line-up for the New Orleans Pelicans, who were beaten 126-121. In Boston, Gordon Hayward came off the bench to score a season-high 35 points in the Celtics' 115-102 victory over Minnesota, and the Dallas Mavericks beat the Charlotte Hornets 122-84 to end a nine-game road skid. Josh Richardson scored 24 points as Miami - playing without Dwyane Wade due to illness - rolled past Cleveland 117-92. Blake Griffin registered 26 points, eight rebounds and seven assists as Detroit beat Memphis 101-94. The Washington Wizards were too strong for the Atlanta Hawks, winning 114-98, and the Orlando Magic overwhelmed the Chicago Bulls 112-84.